The trees comprise a large-scale test site investigation by Natural Environment Research Council (NERC)-funded scientists from the University of Edinburgh in collaboration with Forest Research, Britain’s principal organisation for forestry and tree-related research. Over the next four years, the scientists will be monitoring the site to find out how biochar, a charcoal-like substance made from forestry residue, performs as a fertiliser, nutrient sponge and soil carbon addition. The team believes biochar could be a green bullet for forestry and the wider environment, with the potential to generate income while improving soils, reducing residue and storing carbon. “Forestry is a nationally important industry, but in Scotland it is concentrated on upland, nutrient-poor soils where new trees can be slow to establish. “Every year, wood processing produces about a million tonnes of phosphorus-rich byproduct that could be used to make biochar instead of being sold as low-value mulch for horticulture. “Biochar could help soil carbon recover faster, improve planting success, reduce the need for additional fertiliser during forest establishment and add value to the industry as an additional product. “Over the next four years we’ll be monitoring biochar’s performance, by measuring tree establishment success, growth and tree health. 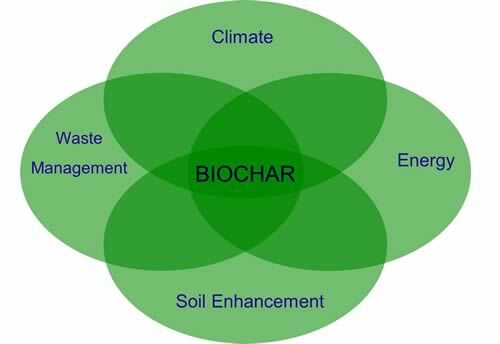 “Biochar has a range of benefits for the environment. As well containing nutrients like phosphorus, it contains a high proportion of highly-stable carbon. Forestry is not the only industry in Scotland that could benefit from biochar.